Song is a well-trained, I mean super well-trained, assassin. Every ounce of her being screams for the kill but due to an accident and a lacking memory, she has found herself in a correctional school for young women that is laced with pathetic, abusive guards and finds herself not so much helpless as she is confused. She knows she was made for something more but her time has yet to come and until it does, the girl’s home is where she stays. This calm demeanor doesn’t last long, however, when one of the guards gets a little to touchy-feely for Song’s liking and before she can even comprehend her actions the man met a swift demise. Her memory starts to come back and before she knows it she is buried face first in the death-ridden reality she lived in before her accident; the one where everyone including the President wants her dead. This book represents an aspect of comics I’ve always found to be lacking – FUN. This girl is impossibly strong, holds endless potential and knows every way to kill someone. She can even slice your throat open with her bare hand! There seems to be nothing she can’t do or defeat. 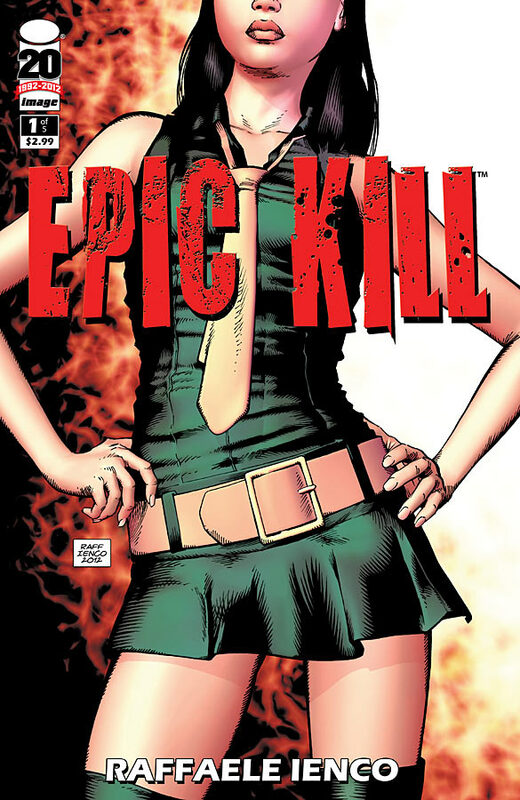 With this as the grounds for the comic and the title simply being Epic Kill, one can only assume after having already witnessed several quality slayings that this comic will be nothing but imaginative and endless action! I’d sign up for that any day. Shoveling out the Epic for this story is Raffaele Ienco. He is the sole mastermind behind this comic and was the sole owner of my attention from the second I opened the book. From the very first panels he hooks you in with not only mysterious elements in both the lack of face for our secret wallower and the revenge sworn upon a young woman’s life but, also with the quality of the art. His line work and blacks are subtle and give a welcoming feeling to the reader. The soft tones of greens and autumn colors leave your mind at ease during some of the more tense moments, thus reminding you via the palate that there isn’t a damn thing in the world that could harm this girl regardless of how helpless she may seem. I was very pleased with the thus far revealed plot and Song’s character overall. She can do everything you have ever wanted to and all with style and grace. She is a young woman on the hunt for vengeance and peace against a world that has long since passed corrupt. With everyone out to get her and without a likely chance in hell they will succeed the question isn’t ‘What will fare of Song?’ but rather ‘How will her enemies meet their demise?’ And judging by how enticing this first issue is, we will all just have to tune in to find out what grizzly tortures await. 4 Samurai wolves out of 5.